There is always a discussion about the skin condition pigmentation as being one of the most challenging skin conditions to successfully treat. What we learn in our base training is simple and does not cover what is truly a very complex process, however it is enough knowledge to know that there are many things that can go wrong, and that lateral thought must be applied to this skin condition. 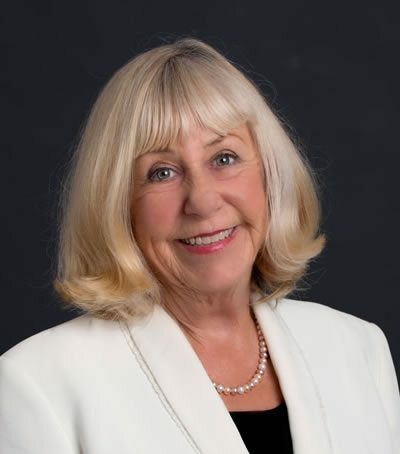 A number of updates regarding the relationship between melanocyte to keratinocyte have been recently published in medical and dermatology journals. This knowledge changes our view on how pigment is transferred across to the keratinocyte, a long debated discussion point amongst professionals. Learning that the keratinocyte has a receptor within the cell membrane for receiving melanosomes reinforces my belief that unless the cell membrane is viable, flexable and permeable these receptors may not function efficiently. The protease-activated receptor 2 (PAR 2) regulates pigmentation via keratinocyte-melanocyte interactions. 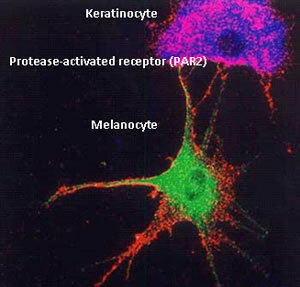 THis PAR-2 is expressed by keratinocytes, but not in melanocytes. This new knowledge changes the dynamics of how we thought in the past. PAR-2 controls melanosomes ingestion and phagocytosis by keratinocytes and exerts a regulatory role in skin pigmentation. Modulation of PAR-2 activity can enhance or decrease melanosomes transfer and affects pigmentation only when there is keratinocyte-melanocyte contact. This new information supports the phagocytosis theory. Protease-activated receptor (PARs) expressed in multiple types of cells and tissues are involved in growth and development, mitogenesis, (Mitogenesis is the triggering of mitosis), typically via a mitogen. Inﬂammatory response regulation, malignant transformation, vascular tonus, and blood pressure regulation. There isanother resident cell of the basal layer that would have the PAR 2 receptor for melanosomes – the basal cell keratinocyte (Mother cell).This cell does not ascend or differentiate as does the daughter keratinocyte cell. The basal cell keratinocyte is attached to the dermal-epidermal junction by keratin filaments called hemidesmosomes (Half a desmosome). Lamina Densa and Lamina Lucida of the dermojunction are thinner under the melanocytes and melanocytes are not connected to the dermojunction with hemidesmosomes. It is now knownthat the melanocyte does not have the PAR2 receptor, so cannot be influenced by misplaced melanosomes as we thought in the past. So what becomes of the misplaced melanosomes if they are not picked up (phagocytized) by the ascending keratinocyte? Melanosomes can become deposited in the pockets and channels of connective tissue that makes up the Dermojunction.Here it can accumulate for many years before being visually seen as pigmentation. Then, of course in later life, if the dermojunction deteriorates that accumulated pigment may become part of the dermis. Here it should be picked up by melanophages. (Note word should). CORNEOTHERAPY: The practice of repairing the epidermis first. IE: Working from the top downwards should establish a healthier spinosum layer giving a denser structure, and this should prevent melanosomes depositing in the dermojunction and basal layer cells. Should we call pigment that has accumulated in the dermojunction ‘dermal pigmentation’? It depends on your personal view and which book you have read; let’s look at some facts. 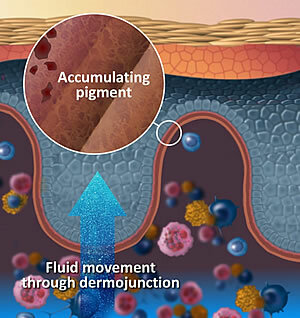 The dermojunction (basement membrane) is important for epidermal/dermal commmuniction and for skin homeostasis. 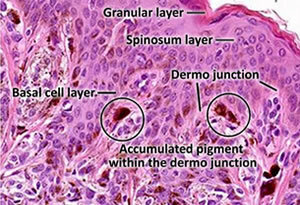 The skin consists of two main layers, epidermis and dermis, separated by the dermal-epidermal junction (dermojunction). Epidermal-dermal communication through the dermojunction is important for skin homeostasis. The basement membrane contains specialized structures, called the anchoring complex, which ensure the stability of connection and communication between these two tissue compartments. The junction serves the following functions: (1) epidermal-dermal adherence, (2) mechanical support for the epidermis, and (3) a barrier to the exchange of cells and of some large molecules across the junction. The proteins within the anchoring complex provide links to the intracellular cytoskeletal keratins in keratinocytes (hemidesmosomes) into the lamina lucida, making it primarily of epidermal origin. The lamina densa composed of (1) type IV collagen, (2) anchoring fibrils made of type VII collagen, and (3) dermal microfibrils makes the lamina densa of dermal origin. An intact basement membrane at the epidermal-dermal junction is essential to stability of the skin. If melanosomes/pigment accumulate into the lamina lucida, one could say that it is still epidermal pigmentation, however if the dermojunction becomes unviable and this residing pigment becomes part of the papillary layer, it is dermal pigmentation. However, do we have all the answers? No, melanogenesis is a complicated process about which we are continually learning. Just try to think logically about structure and function of the skin and avoid following the lemmings down the “marketing” rabbit hole.